According to the Occupational Safety and Health Administration (OSHA), tip-overs are the most common accident involving forklifts. When a forklift is being improperly operated, many factors play into the reasons why it is dangerous. 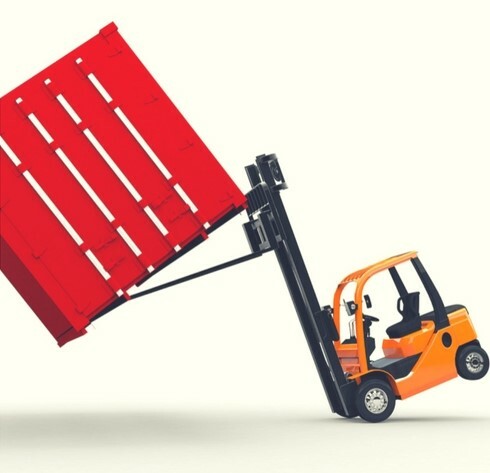 The physics of a load-bearing lift truck, too high of speeds, and not paying attention to the surroundings can lead to incredibly hazardous situations. Tip-overs cause severe injuries and fatalities every year and require excellent safety training to avoid them and keep workers safe. Forklift certification training is essential if you want to protect your life while on the job, whether you’re an operator or a pedestrian. It’s important to understand what causes tip-overs in the first place. When the center of gravity is on the side of the stability triangle, it can cause the forklift to lose proper balance and tip over. This is often caused by turning a corner, carrying an unbalanced load, driving into a pothole, or driving on a sloped surface. See the diagram explaining the stability triangle here to learn more. Other reasons why tip overs occur are when the operator exceeds the load capacity of the forklift, excessive speeds are used when turning the lift, the forklift is turning on an incline or uneven surface, the lift gets too close to an edge on the floor, traveling with the load elevated too high, turning or braking too quickly with a raised load, and tilting a raised load too far forward. There are two types of forklift tip overs; the lateral tip over and the longitudinal tip over. An example of a lateral tip over is when an operator is traveling with a load and moving from a paved warehouse to a gravel storage yard. When the forklift turns onto the gravel, the forklift may tip over to the outside of the turn. For a longitudinal tip over, it may start by an operator driving a loaded forklift down a ramp. If the load is being carried in the front of the lift and is raised too high, the forklift may tip forward as it travels down the ramp. The first step towards preventing forklift tip-overs is to complete a forklift certification. Only trained and experienced operators can recognize hazards and avoid deadly tip-overs. Whether you already have completed training or you still need to certify to operate forklifts, there are a number of things to be aware of and practice to avoid tip-overs and other accidents. When a forklift is operating in a worksite, it isn’t only the operator whose life is at risk should an accident take place. On-foot workers are at risk too. When a forklift is being driven too fast, is turning too fast, is not properly clearing corners, or is not warning others of its presence at cross aisles, a pedestrian may be caught in its path and struck or crushed by the forklift, or pinned against the lift and another fixed object. Forklift operators must never approach a worker standing against a bench or another fixed object head on, and they must sound alarms to warn others when turning a corner or entering an intersection. 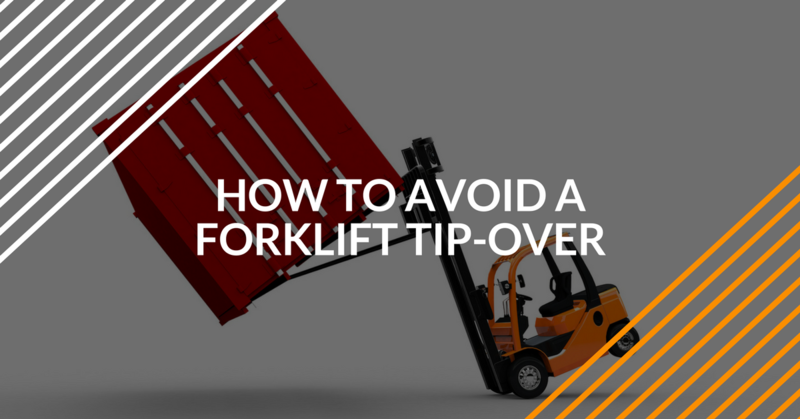 In the case that a forklift tip over does occur, it is important for forklift operators to stay inside the forklift and not try to jump out of the vehicle when it is tipping over. When an operator tries to flee a forklift tipping over, it most often results in serious injuries or fatalities. It may be instinctual to want to jump from a tipping vehicle and get out of the way. However, as a forklift continues into a roll, it usually accelerates rapidly and can crush or pin the worker underneath. The best thing to do if you’re inside a forklift when it starts to tip over is to make sure your seatbelt is fastened, hold on tight to the steering wheel, brace your feet, lean away from the impact, and lean forward. This will help to minimize any injuries resulting from the tip over. That is the safety protocol for traditional sit-down forklifts, but standing lifts should be exited by steeping backwards out of and away from the forklift. If you need to complete your forklift certification to be prepared to handle and prevent tip-overs, check out the online, OSHA-compliant training program at ForkliftCertification.com. Seat belts are one of the most widespread safety devices used in automobiles today. Numerous studies have shown how regular seat belt use limits injuries and fatalities in road accidents. Those same safety concepts apply wherever forklifts are used: warehouses, distribution centers, ports, docks, lumber yards, construction sites, and more. The U.S. Occupational Safety & Health Administration (OSHA) determined that regular seat belt application on powered industrial trucks (forklifts) is important for overall workplace safety. One of OSHA’s landmark rulings regarding standard 1910.178 said that “employers are obligated to require operators of powered industrial trucks which are equipped with operator restraint devices or seat belts to use the devices.” In this ForkliftCertification.com blog, we review how and why seat belts prevent serious injuries and fatalities during forklift tip-overs. You’ll also discover why following OSHA regulations and guidelines related to seat belts can also avoid costly fines and penalties. If you’ve ever doubted how important seat belts are for everyday forklift operation, read this blog today! Loading and unloading cargo is one of the most common forklift uses for workers in a wide variety of industrial settings. Even if you’re not a warehouse or cargo hub employee, cargo handling is a routine for forklift drivers for other jobs and workplace environments, including construction (loading and unloading job site materials), docks and shipyards, maintenance facilities, and many more. OSHA safety guidelines for powered industrial trucks list many requirements for safe and efficient loading and unloading methods. This ForkliftCertification.com article touches on a wide range of activities related to cargo loading and unloading, including preparation, clearance determinations, load stabilization, transporting cargo loads, and other key safety practices. Once you’ve become comfortable with OSHA approved cargo handling, workplace safety automatically increases – and the chance of serious injuries and fatalities decrease! Check out this popular FLC blog for some safety tips & tricks you may not be aware of – and pass along the info to your co-workers and supervisors. When everyone is aware of how important proper loading and unloading is, your whole organization benefits!